A couple of newspaper articles have yielded some new facts about the history of the original cornerstone. Interestingly, the original stone was discovered and re-buried long before June 1944. Our readers will remember that the corner stone of the building was laid last fall, with appropriate ceremonies by the Masonic Order. That stone was obtained, we believe, from the Hamilton quarries, and was immense in proportions; but it worked very poorly, and owing to the splits and cracks which opened through it, it was found to be unworthy to be retained or built upon. Accordingly, it was, a few days ago, removed from the wall and buried in the ground in front of the corner and on yesterday a new corner stone was placed in position. No ceremonies whatever took place on the occasion, the only persons present being Col. Beveridge, one of the Commissioners, the contractors, and a few curious citizens. The tin box containing coins, papers, etc., which had been deposited with the former stone, was securely placed in the new one, while various additional contributions were made by those present. The new corner stone is from the Joliet quarries and is very beautifully chiseled. The panel, which is in relief, is the segment of a circle, with the chord for the base. No inscription has yet been placed upon it, but whether the Commissioners intend having this done, or to leave the matter with the General Assembly, we are not advised. Some days ago workmen employed on the east front, just where the northeast arch of the old steps was taken down, dug down several feet in order to lay some new foundation. While doing this they exposed a huge stone inscribed with the name of the architect of the building, the old State House Commissioners, the date of laying it, and various data. Everybody who saw it concluded it was the corner stone of the State House, and many speculations were indulged in as to what had originally been deposited in it. It seems now that the facts are these, at least such is the story as it now goes: This stone was brought on the ground for that use; but was ultimately rejected and another one substituted in its place. Accordingly, when the men were filling up the ground on the East front, they found a conspicuous hole, so to speak, and, in order to fill it up, they hitched a crane to the big block, dropped it into the hole and buried it. If this story is true, the stone now exposed and supposed to be the real cornerstone, is sufficiently explained and accounted for. The cornerstone for Illinois’ sixth capitol was formally laid on October 5, 1868, in front of the largest crowd ever assembled in Springfield to that date. According to an article in The State Journal, October 8, 1936, “people came from far and near, on railroads, in wagons and carriages, on horseback and afoot, to witness the placing in the foundation of the chief stone of the capitol building.” Evidently two bands were present and played patriotic music for the crowds. An official procession was formed with Captain J. S. Bradford acting as chief marshal. According to The State Journal, in the stone was placed a large metal box in which were deposited official documents of the nation and state from the Virginia Charter to that date, photographs of distinguished men of the day, samples of industries of the state, a bottle of whiskey from P. L. Howlett’s Riverton distillery, and an Elgin watch. Photo: Paul M. Angle, head of the State Historical Library, is shown pointing to the much-disputed, long-lost cornerstone of the state capitol building. The stone to which Angle is pointing is located near the bottom of the steps leading up to the north end of the east entrance to the building. The original is buried nearby. It had to be taken out and a new one substituted when it cracked. Of course it took a number of years, approximately 20, to complete the construction of the statehouse. The original cornerstone was laid directly under the east window of the former private office of the governor. According to The State Journal, once Superintendent John C. Cochran got around to construction of the east wall of the building, the cornerstone had been cracked and was badly deteriorated. The stone was then removed and replaced by a plain stone, identified only by a raised semicircle as if it was prepared for engraving, which was never done. Did the nondescript new stone now contain the relics that were placed in the lost stone? Where was the original cornerstone placed? Was it destroyed? Rumors were that it was buried somewhere on the grounds possibly because the name of former Attorney General Robert Ingersoll, a rumored atheist, was inscribed on the stone. In June of 1944 while replacing the steps on the north approach of the east front of the building workers found the original cornerstone. Evidently the stone had been buried under the steps for over seven decades. The stone was inspected and no contents were found inside. The question of where the contents were only adds to the strange happenings related to the cornerstone. The stone is now located on the northeast front corner of the building just feet away from its original location. What is believed to be the long missing first cornerstone of the present state capitol is pictured a short time after it was unearthed yesterday by excavators engaged in remodeling work on the capitol front. Shown pointing to the ancient stone (it is dated 1867) is Roy Tanner, one of the men employed on the construction project. The old stone was found beneath the east steps. As stated above the contents of the cornerstone were not found for approximately 20 years after the discovery of the original stone. 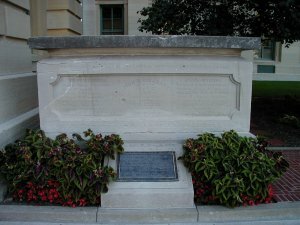 According to an article on the contents of the stone, “The Day We Found Lincoln’s Whiskey Bottle, by Wayne C. Temple, when workers were searching for the original plans of the capitol in 1966, it was suggested by experts that the capsule may have been located in the 2nd unmarked cornerstone. Upon receiving approval from Secretary of State Paul Powell, the cornerstone was opened and the box removed. What was found in the box is very interesting. Among items lying in the box was a unique bottle with the words “This whiskey was made for Abraham Lincoln, Sept. 20th 1860 and presented to him as an Emblem of his Administration, it is Pure, & will grow Better, as it grows older. P. L. Howlett.” (Temple, p. 15) What remains a mystery is whether Lincoln actually ever possessed the bottle. By the way, the plans were not found in the box and no copy has ever been found. On July 2, 1988, Secretary of State Jim Edgar officiated the entombment of a time capsule commemorating the 100th anniversary of the completion of the Statehouse. The plaque over the capsule can be found just north of the original cornerstone at the northeast front of the building. 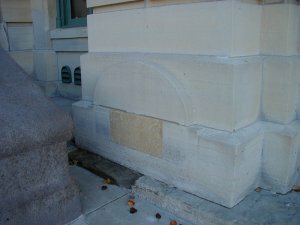 The photo on the left shows the original cornerstone displayed on the northeast side of the capitol. The picture on the right is of the current cornerstone, just to the south of the old one. Plainly visible is the block cut out to remove the contents.